WELCOME TO TJ'S ON THE AVENUE! TJ's on the Avenue is a family-owned, Italian Restaurant owned and operated by the Pulling family since 1992, specializing in homemade pasta, bread, and sauces, which are all made fresh daily. 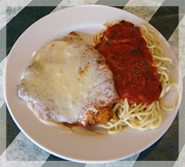 Our menu consists of many different chicken and veal dishes along with our many different pasta dishes. All entrees are served with your choice of unlimited salad or homemade soup. Also, you may try one of our pizzas, or calzones which are also made fresh daily and only the finest quality products are used. Our entire menu is available for take-out. Catering is also available at reasonable prices. Large shrimp sautéed with fresh broccoli, cauliflower, zucchini and carrots in your choice of imported olive oil and fresh garlic or our creamy alfredo sauce, served over homemade linguine.